John Constable always chose compositions which not only showed the beauty of his native Suffolk, but also incorporated people working on the land. 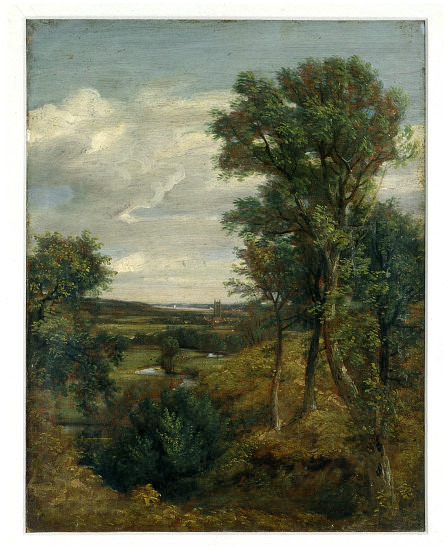 This human interest not only makes his work more visually interesting but also tells us something of the world Constable grew up in, and his idea of an idyllic countryside. Flatford Mill shows men working on the River Stour, work which would have helped bring coal and other goods to and from London, ensuring the successful running of the Constable family mills. Hard work and prosperity went hand in hand in Constable's world. His father worked all his life running Flatford Mill and later Denham Mill. Constable was exposed to the tough lives of the country workers from an early age and along with the happiness many people derived from this life, such experiences helped to shape his view of an idyllic England. 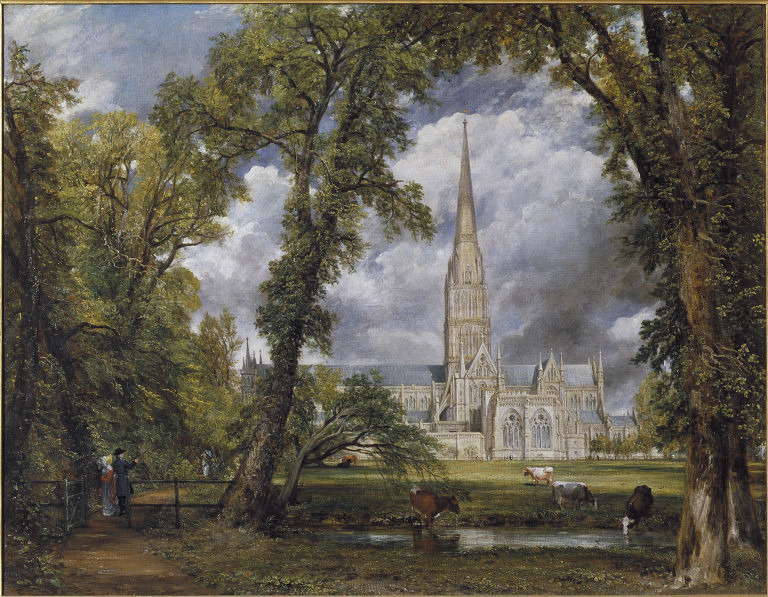 Constable was known to be a very religious man and he lived at a time when the Anglican Church was at its strongest within England. All members of society would have gone to church regularly and not attending would have been frowned upon. 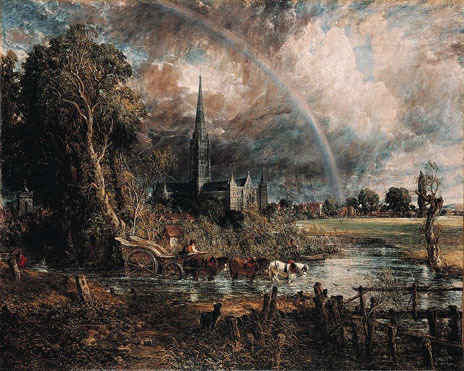 Certainly in Constable's merchant class world, a strong moral code was vital and no-one more than the artist himself preferred God's own creation over the idle frivolities of the day. John Constable always chose to paint nature as it was and was particularly disdainful about his contemporaries who chose to ignore or enhance its virtues for their own gain. This attitude is evident in Flatford Mill, where the artist's incorporates all aspects of country life. John Constable is famous for painting the Suffolk countryside as it presented itself, and Flatford Mill is no exception. 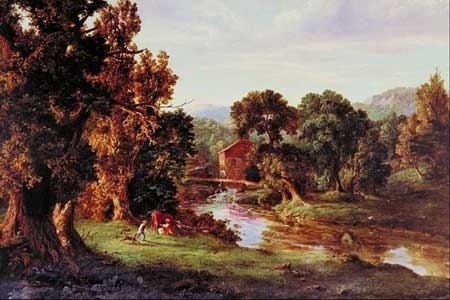 A view which would have been well known to the artist throughout his childhood, it demonstrates the beauty of the countryside and the workers which were part of it. This close bond with the landscape can only have helped Constable choose his compositions for his later works. 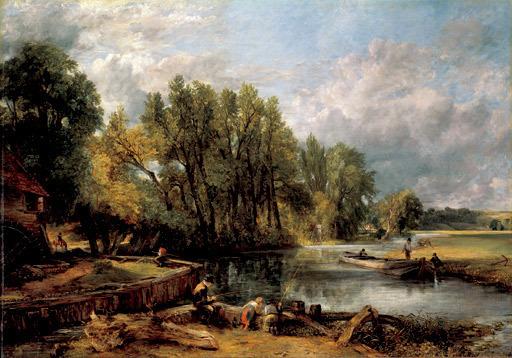 A vanguard landscape painter in his own right, Constable did draw inspiration from other artists but also employed his own very distinctive techniques. Constable never completed a painting in Suffolk itself; instead he created preliminary sketches and finished the paintings in his London studio. These sketches were used as a basis for his work and were followed very closely by the artist so that he could capture the real beauty of nature which he so admired. 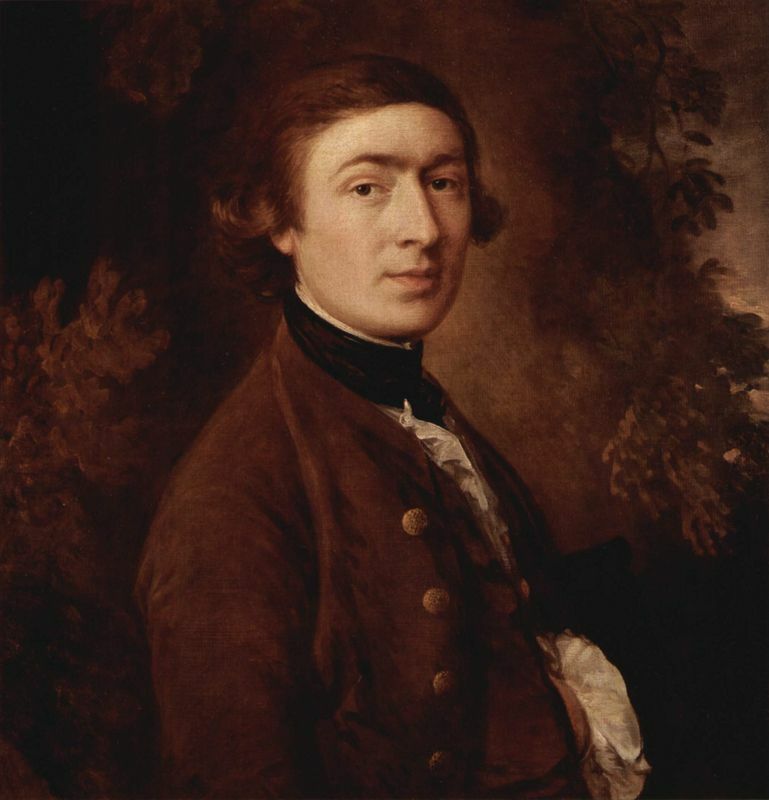 Also from Suffolk, Gainsborough would have grown up in and painted the same landscapes as Constable. This artist was a master of Baroque landscape painting and a pioneer of a genre that was not deemed proper in the portrait painting art world of the time. 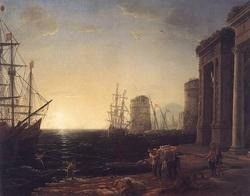 Lorrain's landscape painting helped to make it popular in the centuries to come. Constable esteemed Claude as 'the most perfect landscape painter the world ever saw'. As one of the earliest and most well respected painters to produce landscapes Rubens helped to make them desirable and drew inspiration from his surroundings in his Chateau de Steen in the outskirts of Antwerp, much as Constable did from his beloved Suffolk. Constable completed Flatford Mill in 1817 and as with most of his other works it has become a classical scene of 19th century England. Although it's an idyllic scene it is also one which embodies the hardworking countryside which Constable witnessed firsthand at his father's mill. 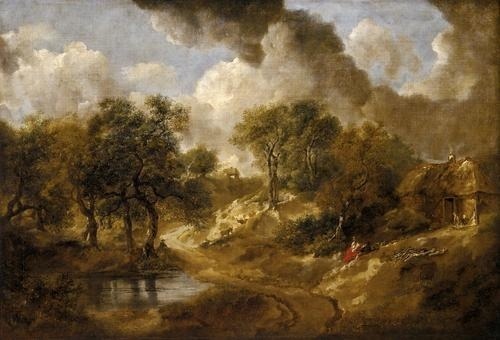 The artist uses a number of techniques which were quite radical at the time and many of them were developed for use in Constable's great six-foot Stour scenes. 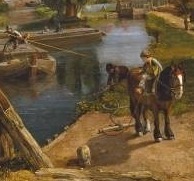 Constable makes the focus of this painting the workers in the forground with the river and path leading off into the distance towards the mill in the background. By doing this he creates a broad vista within which he can contain all the detail he wanted to. The canal to the left and the stream to the right lie at either side of the path and create symmetry along with the blue sky which is reflected in both. 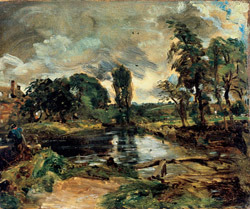 Constable was one of the first artists to use the impasto technique and this thick application of paint allowed him to create movement and depth in the piece which previously may have seemed flat. Highlighting and lowlighting also gave Constable's paintings a realistic edge, with red lowlights in the trees and white upon the water. Constable was a crusader for using natural light in paintings, something which many of his contemporaries did not indulge in. 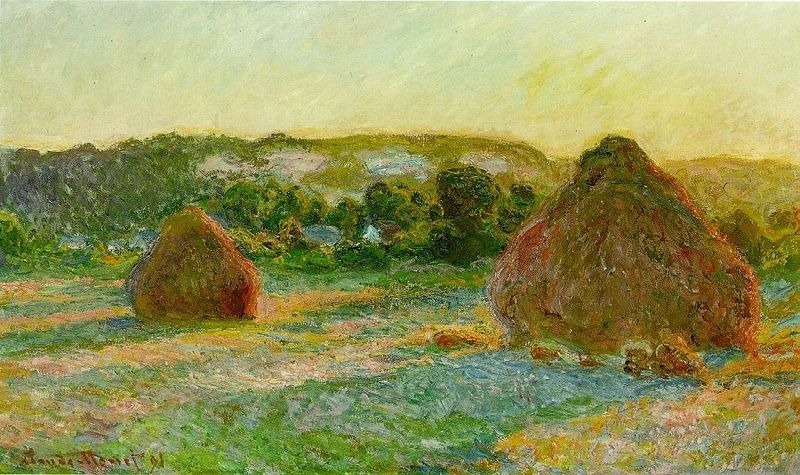 The artist was passionate that with natural light the countryside could be seen in all its glory. He particularly hated the used of foiled lighting for the classical and biblical scenes which were popular with 18th century patrons and critics. The natural palette used in Flatford Mill is highlighted by Constable's use of red to compliment the greens of the trees and add depth to the greenery which may have otherwise seemed lifeless. The artist's otherwise neutral tones are also brought to life by the beautiful summer day's setting which Constable often favoured in his countryside scenes, as well as the realism in the clouds. Although Constable is renowned for painting classic scenes of Suffolk, he often spemt time in the countryside making sketches prior to starting the final canvas. Flatford Mill was a forerunner for many of Constable's six-foot scenes based along the River Stour. It was such scenes that would eventually establish the artist's name in England and France and because of this Flatford Mill was not thought to be a painting of any great value when it was first presented in 1817. 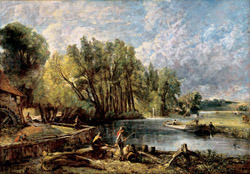 In modern times Flatford Mill has featured in many exhibitions and is noted for its preliminary sketches which illustrate Constable's development and how he went about working on a painting. For this reason Flatford Mill is remarkable, as it is not often that the viewer gets to see how a painting evolved along with the finished product. Flatford Mill, owned by Constable's father and later his brother was integral to the young artist's childhood. It is possible that for this reason, Constable chose to make several oil sketches of this area all of which can be seen as precursors to Flatford Mill itself. Schooled in the local village school for most of his childhood, Constable would spend most of his youth in the Suffolk, sketching the landscape which would feature in all his artwork as an adult. 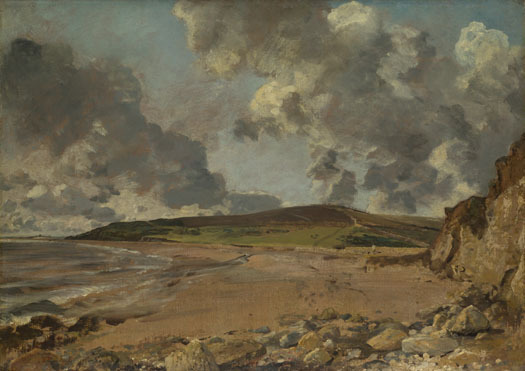 Constable focused on the natural English landscape which he had idolized since childhood. His paintings rebelled against the work of artists of the Neoclassical style who had simply used landscape to display historical and mythical scenes. Instead, he used his work to showcase the beauty and power of nature and his work is today synonymous with the Suffolk landscape and the Romantic Movement he embodied. The artist's most famous works are all based on the Suffolk countryside with which he was so enamored. His techniques and methods of capturing natural light and movement were innovative and still inspire artists to this day. Now referred to by many as 'Constable Country' this county in the south of England will forever be associated with the artist and is thought by many to be the epitome of classical English countryside. As the son of a mill owner, John Constable also understood the ways in which the countryside worked and he often included country workers in his paintings. 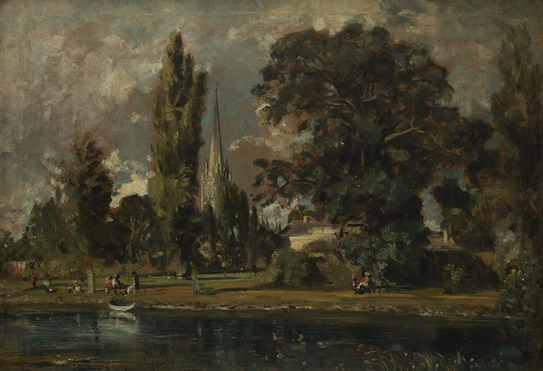 John Constable was born in the second half of the 18th century, at the beginning of the Industrial Revolution when poverty was rife within the poorer communities of England. In the art world, many professionals were rebelling against the pure and realistic lines of the Neoclassical period and started producing paintings and sculpture which took the viewer into a new world, far removed from the realities of everyday life. In this respect Constable was different; he loved painting nature and used it as the focus of his pictures, creating realistic landscapes. 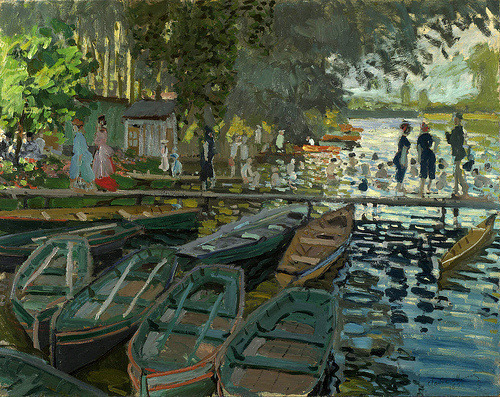 His style was to take a natural landscape and paint it just as he saw it without enhancing or changing it. 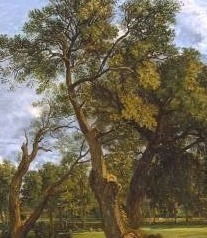 This realism made Constable's work stand out from his contemporaries as well as the techniques he used to create a more life-like feel to his paintings. Constable was a landscape revolutionary and it is thanks to him that the work of Monet and the French Impressionists developed in the way it did. To read more about Constable and his art please choose from the following recommended sources.